The industry of chainsaws if filled with many different products intended for different people. Every day, new models are being introduced by making their previous models obsolete. There are many capable options in the market for the average consumer and even the professional. One of the chainsaws aiming for the throne is the Husqvarna, as one of the overall best chainsaws the market has to offer. This claim is certainly backed by flagship specifications and remarkable customer service with an amazing warranty offered to the customers. This chainsaw has an 18-inch chain blade which is ideal for many tasks like pruning, bucking and the sort. It can be used for regular purposes or even for those people who cut irregularly. What’s more impressive is that the machine uses a 3.2 Horsepower engine combined with X-Torq technology to reap the most out that engine. This innovative technology strives to increase fuel efficiency and decreases the harmful exhaust emission. Furthermore, this chainsaw uses another technology – LowVib which accomplishes the task of decreasing vibration dampening. This, in turn, provides great comfort and convenience to the user and also, the device has ergonomic handles to further enhance the experience. There is Smart Start and combined choke control features. There is also a visible fuel level, which makes it very easy to check the fuel level so you never have to run out of it. The machine has also been designed to start every time you pull the trigger. 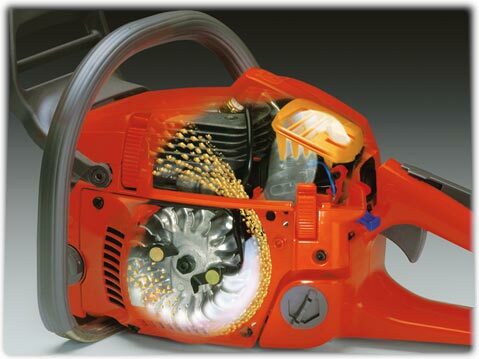 Engine – This chainsaw uses a powerful 3.2 Horsepower engine making it ideal for jobs such as domestic cutting and pruning. It is a great device to be used for medium duty jobs. Also, the chainsaw uses an amazing X-Torq engine technology, which ensures less fuel intake. It also decreases fuel consumption greatly. That’s why it is an economical product for everyone who needs a chainsaw for usually cutting tasks and it would not be a burden in any way and will serve up to the mark. Durability – Another point where this machine wins is durability and reliability. It has been made using the best materials which ensure the longevity of the machine. The components have been designed to reduce wear and tear to ensure long life. Maintenance – Keeping the machine in good condition is also very easy. Maintenance has been made easy on this machine. The air filter is also quick release design for easy replacement. Utility – Working with the Husqvarna is very easy, the machine has been specifically designed to be used by everyone, the amateurs, and the professionals. You just have to turn the machine on; the rest the machine will handle itself. Performance – The performance of the machine must also be commended. It can start even in the worst weather conditions when any other machine of other brands will fail. You won’t have to wait several minutes for the machine to start. It utilizes a combined choke control which accomplishes the task of starting the engine effortlessly. Leakage – Like many machines competing for the top spot, it also faces oil leakage and spillage sometimes. This is seen as a great inconvenience for the users because they have to add more oil and clean up the mess. A quality product should not leak. Smoke – Users also have had complaints about smoke being released from the chain. Although this may have just been a manufacturing defect in some devices, it also affects the credibility of the machine. Carburetor – Another common complaint amongst the users is the unreliability of the carburetor of the device. Some say that it needed replacement the first time they started the machine while others say that it needs to be adjusted. Whatever the case, the company should get rid of these problems as soon as possible. The Husqvarna 450 is a large and strong chainsaw with the specifications of a true flagship, deserving to be at the top. It deals with all sorts of jobs as efficiently as any other chainsaw in the market right now. While it can be used for all sorts of jobs, it is ideal to be used as a medium duty chainsaw. So, if you want a chainsaw for normal average tasks, be sure to consider this model.